Discreet prompting technology for your concert. The latest discreet teleprompting technology for your concert. Autocuehire has been providing teleprompting for many years, providing artist support for all kinds of concerts. 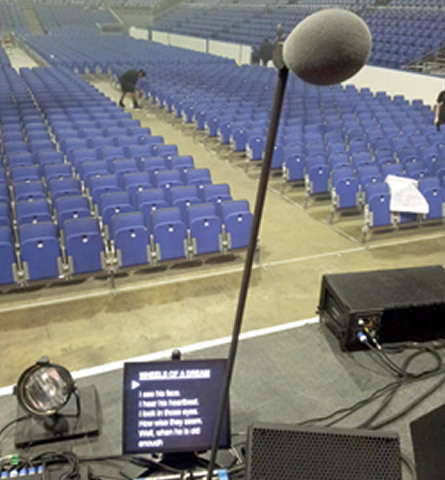 Set lists can change last minute, with a stage autocue, you can be sure that you’re always on track, and because one of our professional operators is controlling the speed of the scrolling lyrics, you can add any messages, notes and directions, and be confident that our operator will scroll with you, and you don’t have to worry about a thing. The Autocue monitors are positioned on the edge of the stage facing the performers and using a fully adjustable stand and mount, can be positioned to suit the eyeline of the artists. They give the performers a massive confidence boost by displaying whatever they need to see; chords, lyrics, lines, music score, tabs. Our autocue monitors are ultra bright, and can be easily read under bright stage lights. The screens are hidden from the audience by black monitor surrounds. Our set up provides a composite DA for an additional output to your own plasma or comfort monitor, should you require. We use Autocue software, designed for professional productions. The software runs on the Windows platform and easily imports word documents. Any changes can quickly and easily be made on site . It allows Runorder management for multiple scripts and supports all unicode languages. Our Autocuehire operators are experienced in live shows, they set up the equipment and control the speed of the content so the performers don’t have to worry about a thing. Our service includes our operator delivering the equipment, setting everything up and then inputting, amending and scrolling your script for you.